When The Land Conservancy announced in January 2014 that we would be pursuing the most ambitious project in our history, raising $12M in just eight months to purchase the Pismo Preserve, we knew that it would take a herculean effort. We have you and our agency funders to thank for your confidence in our ability to see this project come to life. 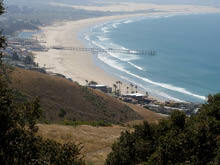 Building projects are not easy, whether it’s a home, commercial property, or a public park such as the Pismo Preserve. The number one construction rule of thumb is “It’s unlikely to go as scheduled”. There are typically four stages of a building project: anticipation, realization, frustration, and finally excitement. We’ve gone through the first and second stages and now we are on to the third. In recognizing this process, we hope you keep in mind our end goal and understand that we want to open the Pismo Preserve as soon as we possibly can. We have turned in our permit application in to the County. In the seven months since we successfully closed escrow on the Pismo Preserve, the pace of our effort has not let up. These past few months, our staff and the Wallace Group have been working closely with the County, the City of Pismo Beach, and our core user groups to design and permit a truly exceptional open space preserve we can all enjoy. Current designs will offer two parking areas: one for passenger vehicles and one for larger vehicles towing horse trailers, two restroom facilities, interpretive and wayfinding signage, approximately 16 miles of trails available to all user groups, and a one-mile ADA accessible trail. While the designs for the Pismo Preserve have taken into consideration all of the comments and concerns we have received from many user groups and our supporters, we will continue our outreach and host a series of meetings to share the conceptual designs and solicit input. Once we have that information, we will pass it along to you. The Pismo Preserve remains closed to the public. Per our grant agreements with our funders, we have to have parking lots and restrooms in place. In the meantime, we will continue to have members-only, docent-led hikes and volunteer opportunities. If you see anyone trespassing on the property, you are encouraged to contact us. Please check our Events page or our Facebook page for updates on any outreach meeting dates and locations or events. Until then, we look forward to the excitement phase of this project with you!